On July 19, 2012, the Ottawa Citizen published an op-ed by Brian Lee Crowley and Ken Coates on First Nations and the natural resource economy. On May 8, 2012, the National Post published a column by Brian Crowley commemorating Nobel Prize-winning economist and philosopher F.A. Hayek. On April 27, 2012, The Globe and Mail published an op-ed by Brian Crowley and Jason Langrish on why trade is in Canada’s interest. On January 31, 2012, The Globe and Mail published an op-ed by Brian on why raising the qualifying age for Old Age Security and the Guaranteed Income Supplement is the right thing to do. On December 14, 2011, the Financial Post published an op-ed by Brian on how NAFTA is really about running a single integrated economy. The op-ed was reprinted in the National Post. On November 23, 2011, Brian was quoted in a Wall Street Journal article discussing mounting provincial debt. On October 5, 2011, Brian was quoted in a Wall Street Journal article discussing how recent opinion polls ahead of today’s Ontario election indicate a possible third straight majority for Ontario Premier Dalton McGuinty. Brian discusses the latest comments by Conrad Black against the government’s tougher sentencing bills, prison expansion plans, and prisoner control programs in the Toronto Star. 5 September 2011. Brian’s column in The Hill Times was reprinted in the Winnipeg Free Press and Edmonton Journal. 30 June 2011. Brian has an op-ed in the Globe and Mail about business taxes. 8 April 2011. Brian has an article in the Edmonton Journal entitled Who pays when provices misbehave? 14 March 2011. Brian has an article in the National Post about the Macdonald-Laurier Institute’s recent study on Canadian crime statistics. 28 February 2011. Brian has an oped in the Moncton Times & Transcript on the planned cuts to Canada’s corporate income taxes. 1 February 2011. This oped appeared in several other papers as well, including the Vancouver Sun and the Winnipeg Free Press. Brian Lee Crowley and The Canadian Century highlighted in The Wall Street Journal. 30 November 2010. As Canadians celebrate Remembrance Day, Brian’s Op Ed, Honouring the Debt We Owe, is featured in the Edmonton Journal, the Moncton Times-Transcript, the Hamilton Spectator and the Saint John Telegraph-Journal. The tribute has also appeared earlier in Veterans Week in the Charlottetown Guardian (subscription only), the Calgary Sun and the Winkler Times today. 11 November 2010. Brian Lee Crowley has a guest editorial on Seacoastonline.com about amalgamation of towns and school boards and whether it would save money and improve administration. 14 October 2010. Here is an oped that appeared in the Buffalo News. Along with Dori Segal, Vice Chairman of Equity One Inc., I suggest that Americans think horizontally about dealing with their housing crisis in a piece titled, Help housing market by luring high-value newcomers. 10 October 2010. Jason Clemens, MLI Fellow and one of my co-authors along with Niels Veldhuis of MLI’s best-selling The Canadian Century, has an article in today’s Wall Street Journal. 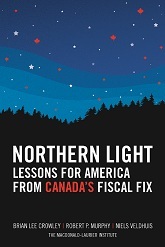 In the piece titled Canada, Land of Smaller Government, Clemens makes the case for Canadian fiscal actions as a guide for Americans. From the outset, he eloquently echoes the arguments put forth in Canadian Century:”When Americans look to Canada, they generally think of an ally, though one dominated by socialist economic policies. But the Canada of the 1970s and early 1980s—the era of left-wing Prime Minister Pierre Trudeau—no longer exists. America’s northern neighbor has transformed itself economically over the last 20 years. The Canadian reforms began in 1988 with a U.S. free trade pact that would lead to the North American Free Trade Agreement. But change really began to take off in 1993. A socialist-leaning government in Saskatchewan started by reducing spending and moving towards a balanced budget. This was followed by historic reforms by the Conservatives in Alberta, who relied on spending reductions to balance their budget quickly. In 1995, the federal government, led by the Liberal Party, passed the most important budget in three generations. Federal spending was reduced almost 10% over two years and federal employment was slashed 14%. By 1998, the federal government was in surplus and reducing the nearly $650 billion national debt. Provincial governments similarly focused on eliminating deficits by paring spending and reducing debt, and then they started to offer tax relief.” Read the complete article here. 9 August 2010. On his blog Filibuster… J.J. McCullough writes: “As a book on the fiscal state of the continent, and the challenges that await in the new decade, it may prove enormously prescient.” 14 July 2010. Peter Jaworski has highlighted the Canadian Century online today at the Western Standard. He writes: Brian Lee Crowley (of the new Macdonald-Laurier Institute), Jason Clemens (Pacific Research Institute), and Niels Veldhuis (Fraser Institute) have penned what I think is a spectacular new book entitled “The Canadian Century: Moving Out of America’s Shadow .” Jaworski, who is a Director of the Institute for Liberal Studies, also posted a video link to Jason Clemens’ appearance at the University of Windsor earlier this year. That video is available on the MLI website… here. 9 July 2010. Celebrate Canada: Tear down the economic barriers, Robert Knox, Brian Lee Crowley and John Robson, Globe and Mail, 30 June 2010. At the request of the prestigious Foreign Policy magazine, the co-authors of The Canadian Century produced an article about what Americans might learn from Canada’s experience. That article has just been published and is available here. An audio version is also available. 25 June 2010. The Canadian Century features on the G-20 “essential reading list” according to the buyers at Indigo. 11 June 2010. I have some advice for the Liberal Party, in the National Post: Before you form a coalition, you need a reason. 7 June 2010. Fred Barnes writes about The Canadian Century, and the lessons it contains for America, in the Weekly Standard. 7 June 2010. Brian Bethune reviews The Canadian Century in Maclean’s, calling it a “cheerful (if bracing) survey of our future prospects” and a “convincing case”. 3 June 2010. InsiderOnline talks about The Canadian Century. 2 June 2010. Allan Gotlieb, former Canadian ambassador to the United States, writes about The Canadian Century in The Mark. 27 May 2010. The National Post is running an excerpt from The Canadian Century in today’s edition. Read it here. 26 May 2010. The second excerpt, which ran 27 May 2010, is here. The Canadian Century is featured in the May 24 edition of The Hill Times. Click here to read the story. The Globe and Mail’s Neil Reynolds calls The Canadian Century a “visionary work”. 24 May 2010. I am quoted in this Hill Times story about faith and politics. 24 May 2010. A “compelling theme”, says the Winnipeg Free Press in its review of The Canadian Century. 22 May 2010. Brian Lee Crowley suggests, in the Ottawa Citizen, that we “rename the portion of Wellington Street in front of Parliament Hill ‘Macdonald-Laurier Way'”. 13 May 2010. Columnist Barbara Yaffe reviews The Canadian Century in the Vancouver Sun. 12 May 2010. In an op-ed updating our Essay in the Globe and Mail of the week before, Tom Adams and I grapple again with the issues surrounding the NB Power-QC Hydro deal, but this time in the pages of the Saint John Telegraph Journal. Because circumstances are evolving rapidly and new information is coming to light all the time, this op-ed is significantly different from the original of the week before, but our conclusion is unchanged: this deal is still, on balance, in the interests of NBers. Tom Adams and I co-authored an Essay in the Globe and Mail of Saturday, Nov. 28th explaining the proposed deal between NB Power and Quebec-Hydro and why it is, on balance, in the interests of New Brunswickers. Go also to my blog page for several postings on the topic. Peter Menzies, former publisher of the Calgary Herald, has written a stimulating review of Fearful Symmetry for Cardus‘s quarterly review Policy in Public. Click on this link and go to p. 33 of the pdf. The National Post asked the political party leaders what books they’re reading. Michael Ignatieff’s response? Fearful Symmetry. Liberal and Globe blogger Rob Silver has posted about Fearful Symmetry on his blog. More evidence that the ideas in the book are the property of no political party and of every party. Click here to read George Abraham’s review of Fearful Symmetry for CanadianImmigrant.ca. Journalist and author Rory Leishman has written a new review of Fearful Symmetry for www.ProudToBeCanadian.ca.If you don’t know Rory’s book, Against Judicial Activism, I commend it to you. Oh dear. I seem to have stuck a stick in a hornet’s nest in Quebec. Pour old Jean-Luc Migué and his faithful collaborator Gérard Bélanger are so worked up that, like Tom Courchene in La Presse and the Globe, they have taken to the pages of the National Post and Le Devoir to denounce me and all my works. I’ve already responded in my blog to some of their arguments, and have submitted an op-ed to Le Devoir responding to others. We’ll see if the doctrine of equal time applies! Lars Osberg, trendy leftie in the Dalhousie Economics Dept. and scourge of all things AIMS, has taken 14 pages to vent his spleen about Fearful Symmetry in the latest issue of The Canadian Literary Review. In the next issue I get 400 words to respond to his 14 pages. That’s all I need (-; When the time comes I’ll post it on my blog. Lise Payette, la doyenne of the Quebec nationalist/sovereigntist movement, has lots to say about Fearful Symmetry in an op-ed she wrote for Le Devoir on Friday, 2nd October. Of course she predictably tries to make the book into a plea for the rest of Canada to kick Quebec out, which is actually the exact opposite of what I said! Still, she says the book should be on the bedside table of every self-respecting Quebecker. Tom Courchene responded to my Globe op-ed of 25 Sept. with an op-ed of his own, allegedly as a rebuttal. But as I say in my blog, this is one pretty peculiar “rebuttal”. He essentially repeats the same arguments in a piece in La Presse, but that is, alas, not available on-line anywhere I can find. In response to the news on the Globe’s front page (25 Sept. 2009) about the addition of 30 or so seats to the Commons, I wrote an op-ed piece explaining why Quebec’s demographic weight was dropping relative to the rest of the country, and particularly relative to BC, Alberta and Ontario. The op-ed summarises some of the arguments in Fearful Symmetry. Chantal Hebert has written two column about Fearful Symmetry. The first, which appeared in Montreal’s Le Devoir, says “Si la classe politique québécoise ne devait lire qu’un ouvrage canadien cet automne pour prendre le pouls, changeant, de la relation Canada-Québec, ce devrait être Fearful Symmetry.” The summary translation: if there’s a Canadian book the Quebec political class must read this autumn, it is Fearful Symmetry. For those whose tastes run to reviews that don’t engage with the author’s ideas, but attempt to discourage potential readers by writing about a caricature or straw man, you’ll love this dyspeptic review from the Winnipeg Free Press. Again thanks to Jonathan Kay, the second and last extract from Fearful Symmetry was posted in the National Post today, 19th September 2009. In this extract I outline the historical process by which Canada abandoned many of its historical traditions, as well as its friendly rivalry with the United States for the title of the land of greatest opportunity in the world. My good friend, Monte Solberg, will be known to many of you as a former federal cabinet minister. What fewer of you will know is that Monte is a gifted blogger, a hilariously funny man and a passionate Canadian. In his column in the Sun newspapers (Calgary, Edmonton, Winnipeg, Ottawa and Toronto) on Friday 18th September, he wrote a very generous piece about Fearful Symmetry which he called the best book he had ever read about our country. Jonathan Kay at the National Post has taken a keen interest in Fearful Symmetry. On September 18th he published the first of two extracts from the book. In this one a central idea of the book’s architecture, the bidding war for the loyalty of Quebeckers, is introduced. On June 24th, 2009 Barbara Kay published a column in the National Post about the future of Quebec-Canada relations. In this piece she drew heavily on the arguments in Fearful Symmetry about the past and the future of the “bidding war” for the loyalty of young Quebeckers.